Planet barcode is used by the United States Postal Service to identify and track mail during delivery – the Postal Alpha Numeric Encoding Technique. 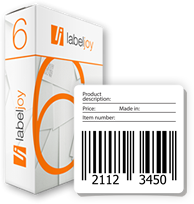 Planet symbols encode 12 or 14 digits only, where the last digit is a check digit, automatically calculated by Labeljoy. Therefore, only 11 or 13 digits can be entered. Only texts of 11 or 13 digits will be considered.